HARRISBURG—Rep. 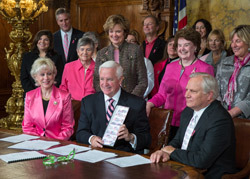 Todd Stephens joined constituent Pat Halpin-Murphy, president and founder of the Pennsylvania Breast Cancer Coalition, as Gov. Tom Corbett signed Senate Bill 358 into law. The new law now requires the notification of breast density to patients who receive a mammogram. Patients currently receive mammogram results, but not breast density information. Unfortunately, highly dense breast tissue can make abnormalities more difficult to see. This notice requirement will inform patients that additional screening tests may be necessary.